To find out what this photo is all about, visit the Maine’s First Ship website. If you are into history or boats, it’s a really great project. It’s a really neat project! That is a really cool shot! Yours usually are. I need to take some lessons so I can better use the camera that I have. It’s a shame to waste such a nice camera! Alexa recently posted..July Giveaway – Google Nexus 7 16GB! You know what’s funny? My best shots tend to be from my iPhone. I took this one with my phone in the middle of a local festival during the July 4th holiday. Going to have to research this more! Enjoy! I find this stuff fascinating. The lines are definitely what drew me to take the shot. Very cool! Cool! A friend of ours is currently building a wooden sailboat. Neat. It’s a lost art, I think. It’s quite fun to watch. Going to look it up! Striking photo for sure. And it seems to tell a story I want to hear. Tamara recently posted..Over The Top. Just walking by the structure makes you want to know more. Love it! Wow such amazing picture I would love for you to post something on my wordless Wednesday link up party on my blog! I will check it out, Jenny! Thanks for stopping by. Definitely a very cool project! And I’m impressed that you took that with your phone. 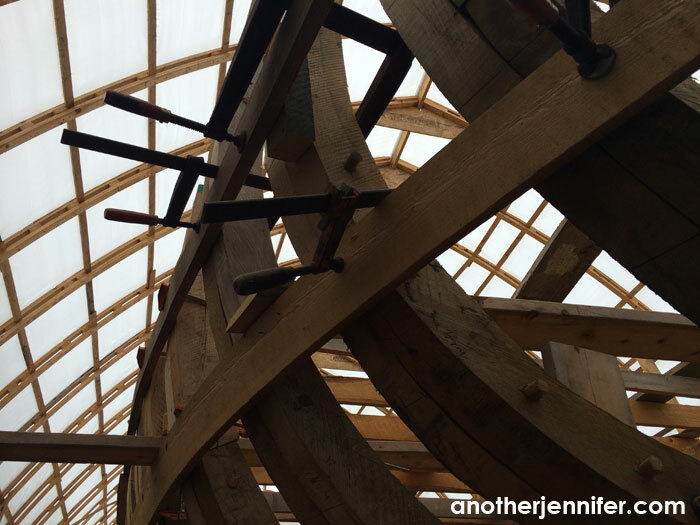 I immediately want to know about this project… this ship… such a cool shot Jennifer!! It’s a really cool project!